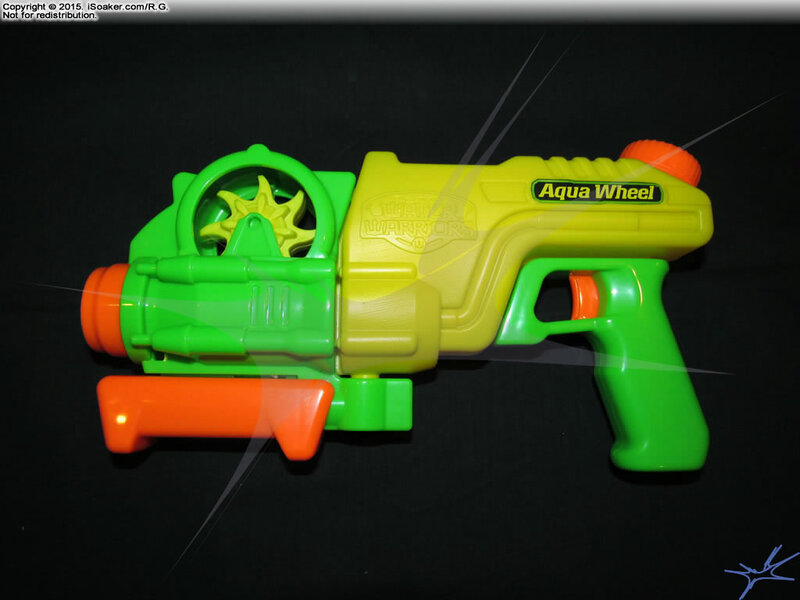 The Water Warriors Aqua Wheel is a new pump-action water blaster with a novelty function released by Alex Brands Buzz Bee Holdings for 2016. 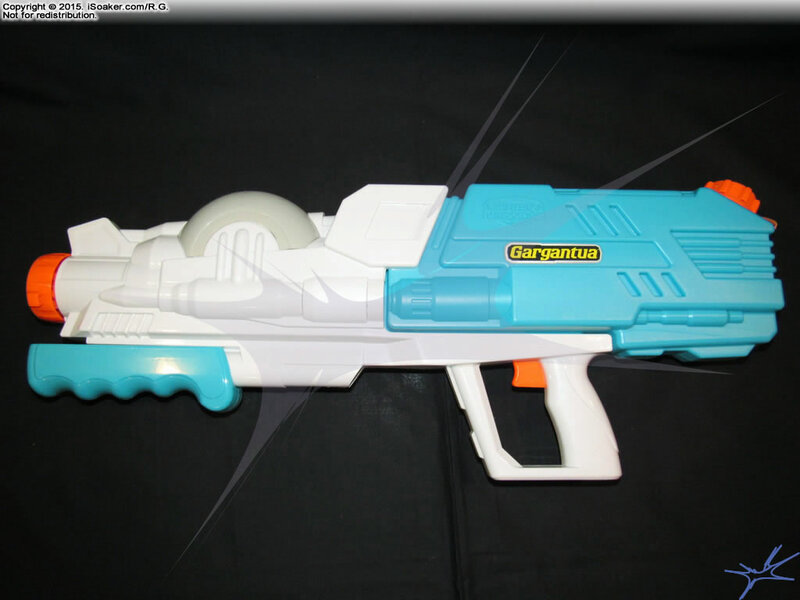 Being a pistol-sized water blaster, similar in size to a Water Warriors Goblin or Water Warriors Chameleon, neither its capacity nor output are expected to be as high as larger blasters. However, its prominent forward-mounted novelty wheel and ease of operation may appeal to younger users. 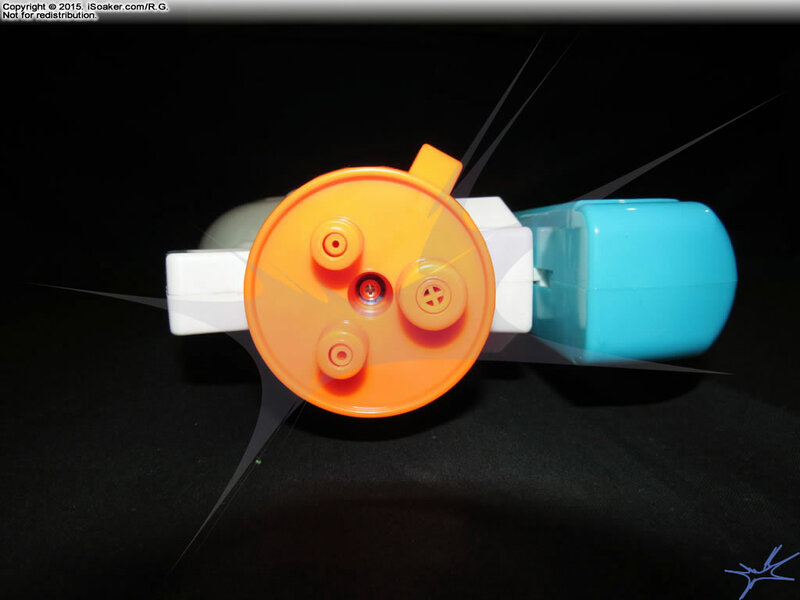 In its packaging, the Aqua Wheel's wheel is readily visible. However, due to its smaller size and the need for the package to have the strength to stand up, both the pump grip and rear grip are obscured by the forward panel. The apparent trigger on the rear-grip is purely ornamental, but that is unknown at first glance. 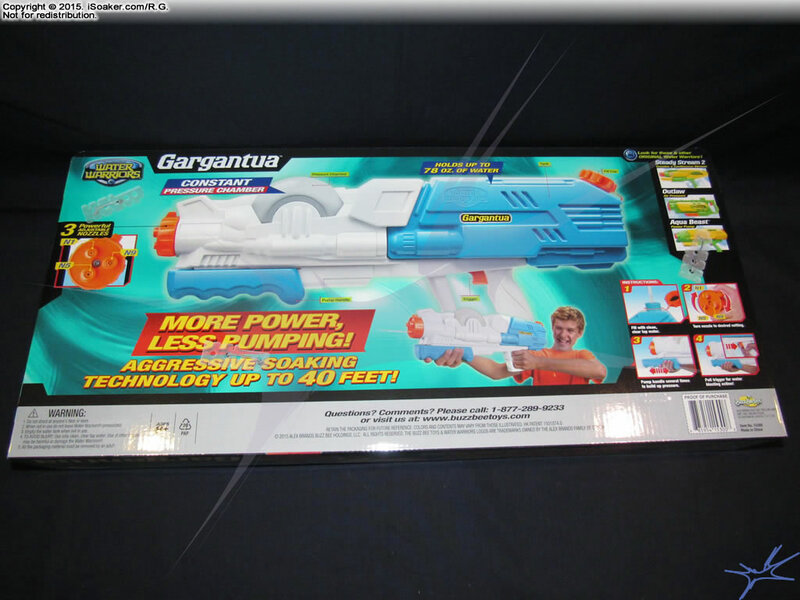 The back s ide of the box shows a picture of the unboxed Aqua Wheel, though the decision to still include the graphic of someone using it covers the lower part of the rear grip. The Aqua Wheel's spinning action is called out. As is common on Water Warriors' packages, a series of self-explanatory instructions are also presented. 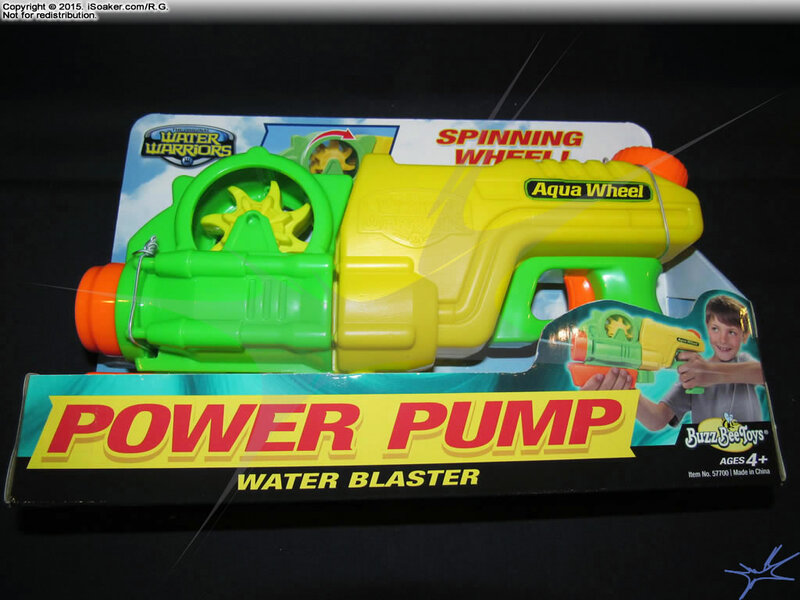 According to the box, the Aqua Wheel "Blasts up to 25 feet! ", but this statistic remains to be tested. Free from its packaging, the full glory of the Aqua Wheel comes to view. The reservoir appears to occupy the latter 3/5 of the blaster while the forward part is made up of the spinning wheel mechanism and pump. 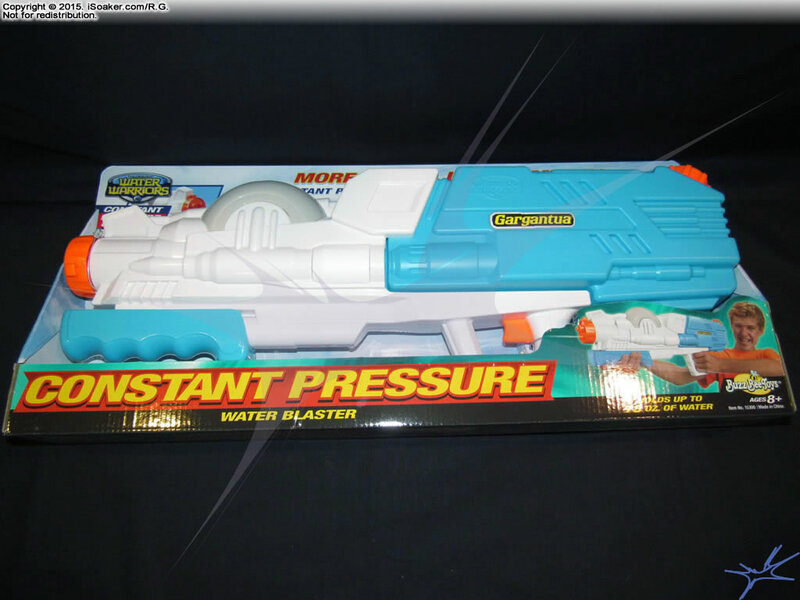 The ornamental trigger may make some think that this could be a pressurized water blaster, but this is not the case. While the wheel area has some detailing, both the trigger grip and rear grip are smooth, even glossy, but still have contouring. The wheel, itself, is an interesting swept 8-pointed star shape with multiple layers of detailing. Beyond looks, it also turns out this enables its function as well. The Aqua Wheel features a single nozzle powered directly by its pump. As such, it is unable to produce a continuous stream, but this is less of an issue for smaller water blasters. 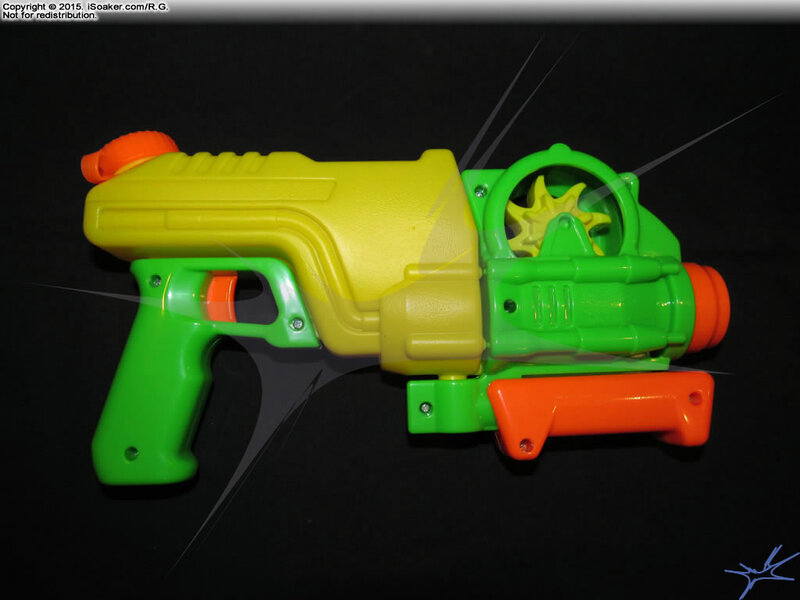 The volume pushed out per pump is more than trigger-pump-based water blasters, but on the low end for pump-action water blasters. The stream produced does seem a little thicker than expected, but its duration is very short. Good for younger users, do not expect to thoroughly soak anyone using the Aqua Wheel alone. The Aqua Wheel holds an expected amount of water for its size. The reservoir is accessed through its top-rear mounted tethered cap. The cap has a small hole in it to permit air to enter the reservoir was water is drawn out, but due to to have no valve gating the hole, the blaster may dribble if it angled such that water in the reservoir ends up positioned against the opening. The cap, itself, does not screw tightly on the reservoir; in fact, both the cap and reservoir are only lightly threaded. However, it does hold closed, preventing water from splashing out, though its closure should not be considered as tight enough to prevent dribbling if a filled Aqua Wheel is left on its side for long. As noted earlier, the pump directly powers the nozzle, yield decent, albeit brief streams. 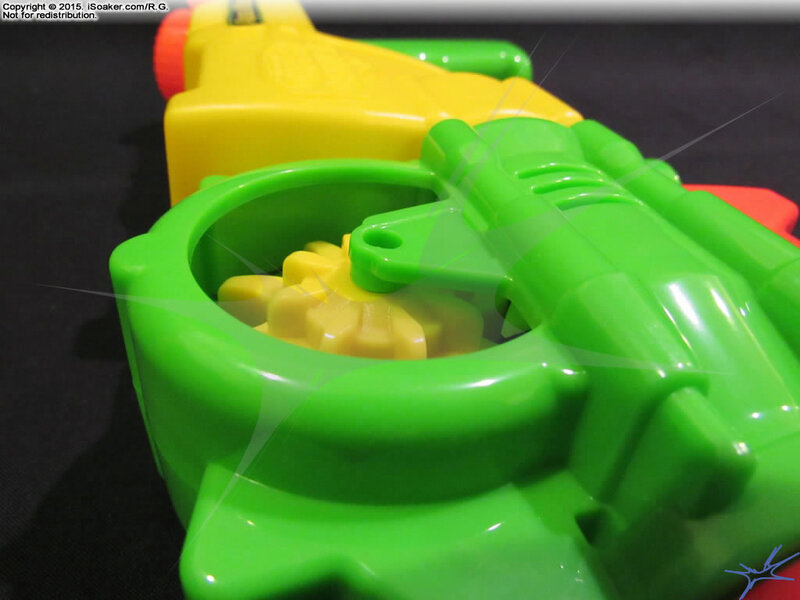 While the pump grip plastic is smooth, it is decently sculpted, proving natural positions for one's fingers to pull the pump out as well as push the pump back towards the blaster, allowing one to generate a decent amount of force per blast. Pump stroke length is not very long, but this is not surprising for a blaster this size. Beyond blasting with each pump, the pump also activates the wheel spinning feature of the Aqua Wheel as described below. 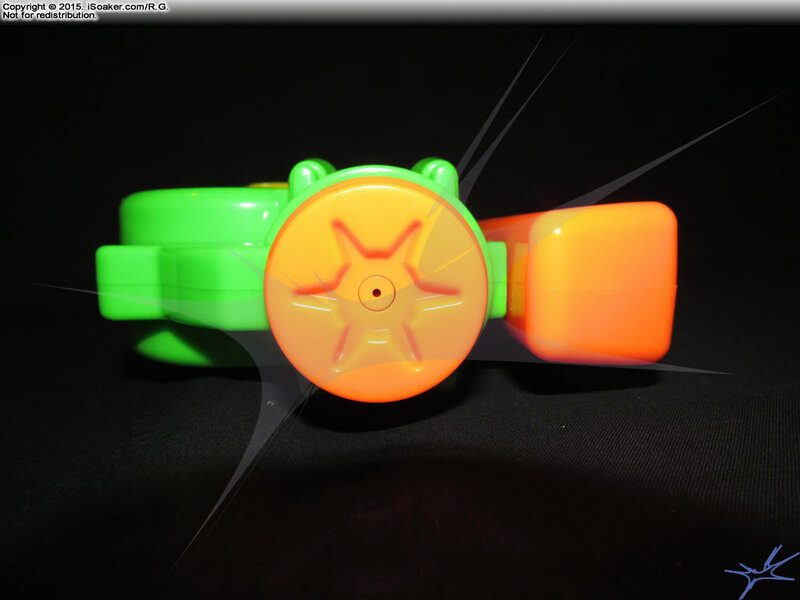 As its name indicates, the Aqua Wheel features a top-mounted wheel that spins with every full pump. This feature works whether the Aqua Wheel is filled or not, allowing one to play with the Aqua Wheel's spinning function for role-playing/imaginative play any time. Though the pumping action activates the wheel spinning mechanism, it works a little differently as one may expect. Instead of the pump rod driving the wheel, there is a small tab that sits in the pump-grip's guiderail (see picture on the left). As the pump grip is pulled out far enough, this tab then drops down. 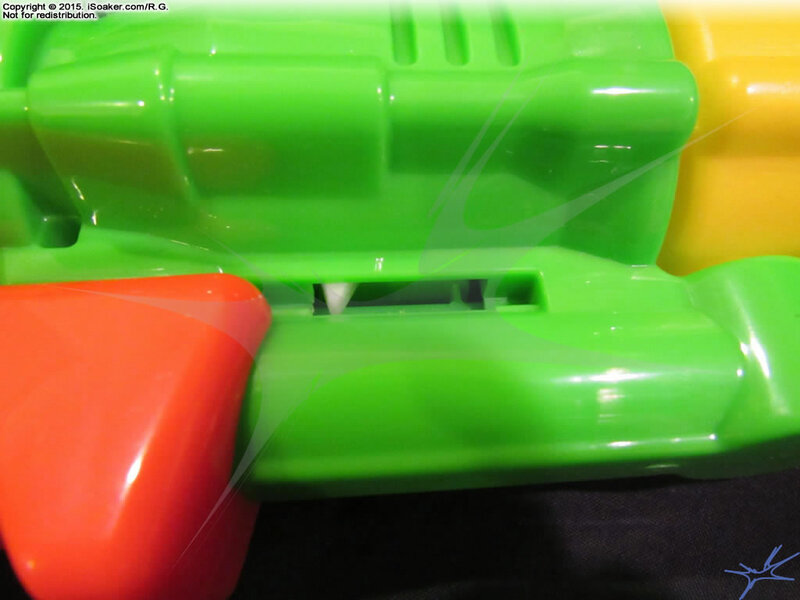 Then, as the pump grip is pulled back towards the blaster, part of the grip pushes on the tab. This tab is actually part of a spring loaded panel (the white piece to the right of the wheel on the picture on the right. As the tab is pushed backwards, the panel pivots forwards, striking the smaller notched part of the wheel, making it spin. Admittedly, it is unclear what prevents the panel from hitting the wheel again when going back to its resting position. Interestingly, the wheel seems to spin better when the Aqua Wheel has water since the resistance of the water being pushed through the pump limits one's pumping speed slightly, making the wheel spin more consistently. While the wheel can be made to spin without the presence of water, the lack of resistance when pumping can lead to one trying to pump too rapidly, thus increasing the likelihood of catching the wheel spoke at a sub-optimal position, sometimes resulting in unintentionally temporarily stopping the wheel's rotation. Note: Beyond spinning, the wheel does not enhance or alter performance of the blaster's stream. 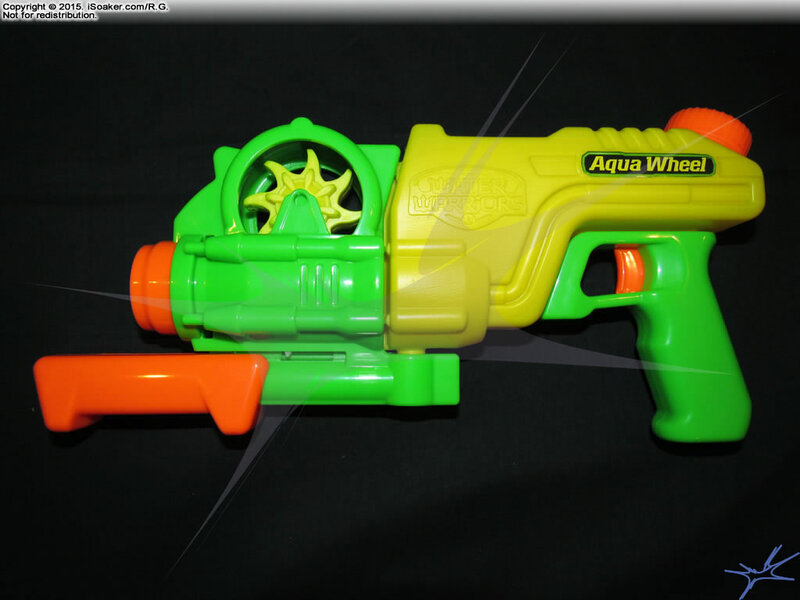 The Aqua Wheel feels decent for a blaster of its size. 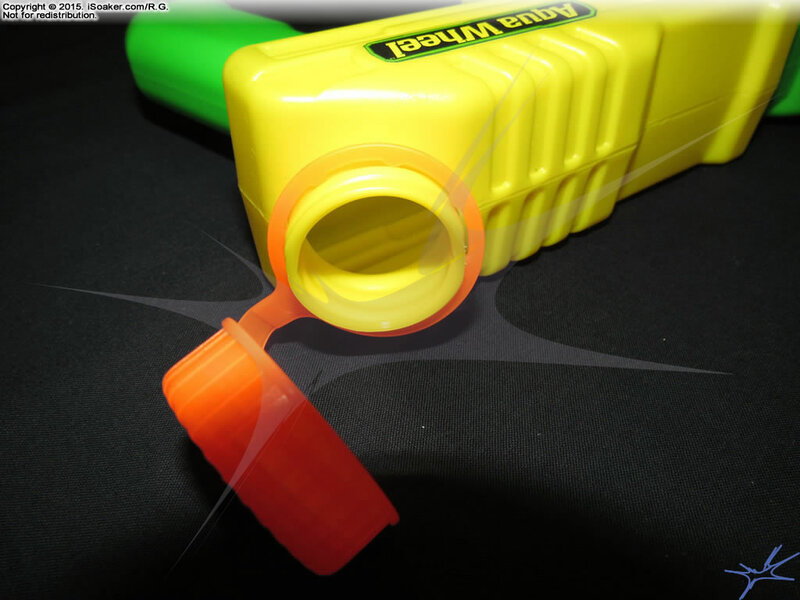 Though its grip regions are small since the overall water blaster is small, as they are both unobstructed, even users with larger hands will not feel cramped. Texturing on the grip areas would have been nice, but as both are decently sculpted, one's fingers quickly find a natural position for holding and using the Aqua Wheel. The inclusion of the ornamental trigger neither adds nor detracts from the rear grip. 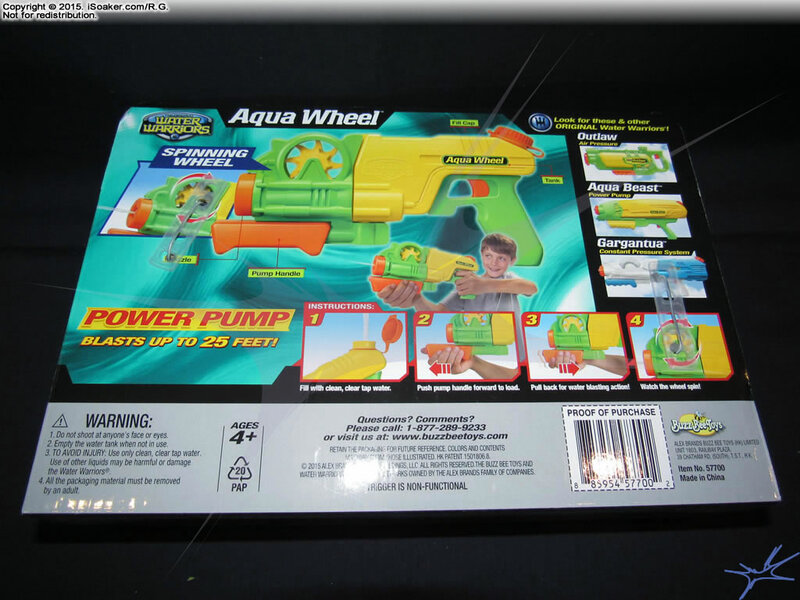 The Water Warriors Aqua Wheel is a fun, small, pump-action blaster. While its capacity and output will not drench an opponent, the Aqua Wheel does perform decently for its size. Intended for younger water warriors, the Aqua Wheel's spinning wheel action adds a visually fun motion that also servers to get the user to pump faster (in order to make the wheel spin faster) with the benefit of also pushing more forceful streams. 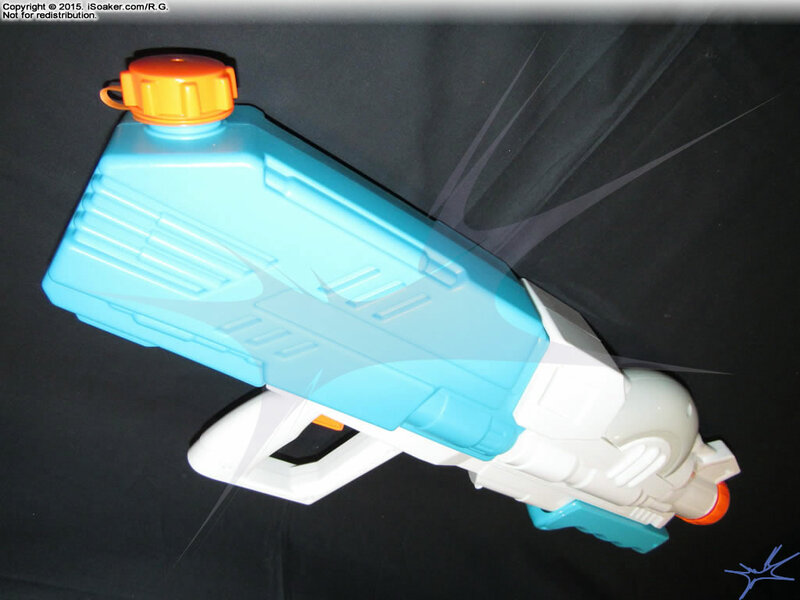 Good for casual, light water fights, the Aqua Wheel is quickly outclassed by most larger pump-action water blasters and nearly all pressurized water blasters.